Bjartefau , a pro from Norway won the Sunday Warm Up event took place on 3rd March 2016, which attracted 2,456 and generated a cash prize pool of amount $491,200. Bjartefau took home $77,610 as winning share, while the runner up of the event was an Australian imluckbox, who received $58,290. Out of total entries top 360 places were paid for this particular Sunday Warm up event took place on PokerStars, the world’s leading online poker portal. “poker@luffyD”, the guy who did really well back in 2013 at WCOOP Event#2 was also a participant and completed his journey to fourteenth position to collect $2,505 as winning share. It took eight hour to decide which ten players would be in business at the final table of this week’s warm up event. Here is the seat structure and chip counts for the players. Seat#1 was for Bruno chato of Brazil with total 1321468 stacks, seat#2 for bjartefau of Norway with 1859139 in chip counts, seat#3 was for Aguskb of Mexico who had total 3875410 chips with him, seat#4 was for a Russian player named Pa3yM with total 1507930 chip counts, seat#5 was for Australian imluckbox , who had 5344511 chips with him, where Canadian poosnack11 (2417989) was at seat#6 to this event. Seat#7,Seat#8 and #9 belongs to players named as Spowi07 of Austria, dennishtm (3649927) and a Canadian pro TMoney0209 (2422917). First elimination from the final table was of poosnack11. 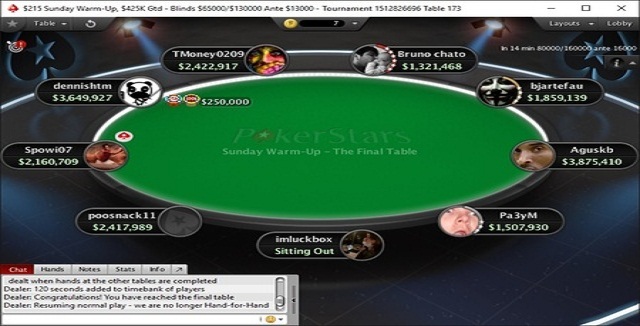 The player got eliminated just after three hands of play took place in final table. 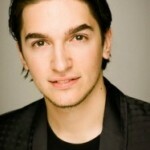 He was having Q♦Q♥ besides of Dennisthm’s K♠A♦ and knowcked out to ninth position for $4,175. Then just after a couple of hands it was Spowi07 who hit the rail for eighth position and collected $7,122 as wining share. Five hands later Brazilian Bruno “Bruno chato” Nunes failed to maintain the pace and was at seventh position with total $12,034. Russian Pa3yM becomes sixth position holder of the event with total $16,946. He had A♦9♣ and towering over dennishtm’s 8♠A♥, but could not cross the board T♥ 3♠ 2♥ 5♥ 6♥ and becomes at losing side. The fifth, fourth and third places goes to Canadian TMoney0209 ($21,858), “Aguskb” ($28,735) and dennishtm($41,752). The heads up took place among bjartefau and imluckbox. 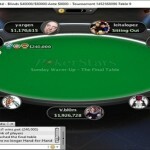 At that time bjartefau (17 Million) was having a hugh chip lead over imluckbox (7.5 Million). bjartefau had A♥9♦ and imluckbox had J♥J♣, to which the board was 3♣ K♥ 7♠ 5♥ 8♠ meaning bjartefau is the winner and would take home the first prize of amount $77,610.